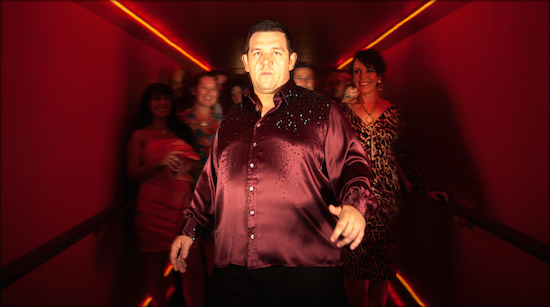 Let’s face facts, Nick Frost is a very funny guy. As one half of a dynamic duo with Simon Pegg, he’s entertained us in countless films such as Shaun of the Dead, Hot Fuzz and the recent The World’s End. But now, he’s going it solo in his latest big screen adventure Cuban Fury. Twenty-two-years later, an adult Bruce Garrett (Nick Frost) finds himself out-of-shape and unloved – trapped in a downward spiral of self-pity, repression and Nando’s take-outs. Only Julia (Rashida Jones), his smart, funny, gorgeous new American boss, gives him reason to live. But she’s untouchable; out of his league. Look for Cuban Fury, which also stars Rashida Jones and Chris O’Dowd, to heat things up in theaters on April 11. Check out the trailer after the break. When we need a good laugh around the office, or at home, we often watch one of two movies: Shaun of the Dead or Hot Fuzz. Both of these are highly amusing and also filled with action, great characters, extensive pop-culture references and excellent performances. Did we mention they’re also damn funny? They are. So, when the team behind those two movies gets together to make a new one, we get very happy. The new one in question is The World’s End, directed by Edgar Wright and starring Simon Pegg, Nick Frost, Martin Freeman, Paddy Considine and Rosamund Pike, it’s the the story of childhood friends who come together after 20 years to stage an epic pub crawl. Of course, things do not go quite as planned. And thank goodness for that. Check out the trailer after the break. 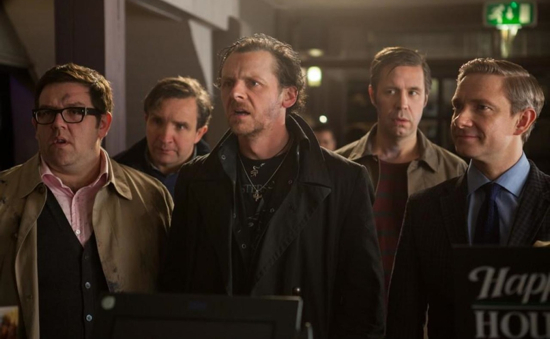 Look for The World’s End to hit the U.S. on August 29th. Bradley Cooper’s mind twisting thriller Limitless outperformed box office predictions and handily won the weekend box office with $19M. It also was a hit with audiences, earning a B+ cinemascore. This is Cooper’s first true starring vehicle, and with a budget of around $27M, it should easily prove profitable. With The Hangover 2 right around the corner, Cooper will surely confirm his status as an A-list talent. Johnny Depp helped propel Rango to number two with $15.2M. It dropped a respectable 32% from last weekend, bringing its three week total to $92.6M. Battle: Los Angeles took quite a tumble; dropping off 59% from its opening weekend. It managed to make $14.6M over the weekend. Matthew McConaughey scored fourth place with his Lincoln Lawyer debut. The film made $13.4m and was well received by audiences. Entertainment Weekly reports that this is the first film to join forces with Groupon. The popular daily coupon site sold discounted tickets to the movie for $6. They sold almost 200,000 tickets. It will be interesting to see if this model will be adapted by future films. While Simon Pegg and Nick Frost are off discovering aliens named Paul in the desert, and Edgar Wright allegedly helps the Marvel Universe get an Ant Man, fans of Hot Fuzz and Shaun of the Dead everywhere are pacing back and forth for the next time the three will do another film together. Well, you may not have to wait forever, just until the end of the world. In a recent chat with io9, Wright explained that he’s taking some time off from the easy genre-spoofing and work on a really meaty project. One about the end of the world. Pegg and Frost’s Paul can be seen in theaters on March 18th and Wright’s Scott Pilgrim Vs. The World is currently available on Blu-Ray and DVD everywhere. While Hollywood has proven that magicians may look cool, they definitely don’t always rake in the big bucks across the globe. It’s been shown time and time again with films like The Prestige, The Illusionist, and The Sorcerer’s Apprentice. Though, for that last one, we blame Nic Cage. It looks like Working Title films, the company behind the series The Tudors and the film Hot Fuzz, are now working on a brand new adaptation of the classic Merlin tale, which will take the old wizard to modern day. The script comes from historical novel author Jay Basu, who plans on rebooting King Arthur’s spiritual wizard in a “contemporary setting.” Expect to see the film to keep a prominent British cast, as most of the films from Working Title are done out of the UK. Not much is known about the script or what we can expect from the film, but you can expect to see plenty of respect paid to the character, as legendary actors like Sam Neill, Ben Kingsley, and Donald Pleasence have donned the robe and pointy hat at one point. Keep it here for more news on this film as it develops. Nerds everywhere have been hearing more and more about the next big Simon Pegg & Nick Frost (stars of Shaun of the Dead and Hot Fuzz) film called Paul. All we really knew was that it starred our favorite English duo plus Bill Hader, Jason Bateman, Sigourney Weaver, Kristin Wiig, and Seth Rogen. That is until a little show called San Diego Comic-Con happened, and now all we want is more from the film. The premise of the film has Pegg and Frost as two Brits traveling across the country on their way to Comic-Con. Along the way they come across a rogue alien escaping from Area 51. Rogen lends his voice as the titular Paul, the alien, with Bateman and Hader as the Men in Black-style FBI agents who are sent to retrieve him. From what we hear, the footage they showed during the Comic-Con panel did the film more justice, but this will appeal to the mass audience. Expect to see plenty of fan service throughout the film, as just about everyone involved in it has some bit of geek cred to their name. Check out the first trailer for the film after the jump. Catch Pegg and Frost in Paul on March 18th of next year. This year isn’t all that heavy with comic book movies. While we have films like The Losers and Jonah Hex, they don’t really compare to the anticipation by both comic fans and video game fans alike for Scott Pilgrim Vs. The World. The film comes from Hot Fuzz and Shaun of the Dead director Edgar Wright, who already gained Whedon-esque geek credibility with international audiences. In both of his previous films, he turned a genre like “zombie films” or “80s action films” into his own parody, and he’s doing it all over again with video games in Pilgrim. In the movie, based on the series of comics by Bryan Lee O’Malley, Scott Pilgrim (Michael Cera) falls in love with a pink-haired girl named Ramona Flowers (Mary Elizabeth Winstead). They start to date and everything seems swell, until Scott is told that in order to date Ramona, he has to defeat her 7 evil ex boyfriends. It all plays out as ridiculous as it sounds, with some pretty amazing visuals, and intense fight sequences from the ex’s (played by Jason Schwartzman, Chris Evans, Brandon Routh, and more). Check out the first full trailer after the jump, and be sure to catch Scott Pilgrim Vs. The World in theaters August 13th.